Need a few lateral file cabinets for the office? If yes, there’s no reason why they can’t be stylish. 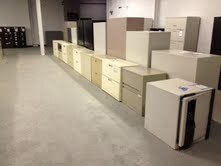 Mark Downs Office Furniture has a variety of elegant and useful lateral file cabinets in stock. A beautiful and high functional office is always possible when simple organization is created.It’s all about having quality products with style and taste that makes an ordinary office, the perfect office. Decorate you office with lateral file cabinets alongside contemporary offices desks and computer armoires. You can integrate these filing cabinets with file drawers to truly optimize your office space and work productivity. Use file cabinets as a decorative statement by painting them with a splash of color such as the colors used on your brand logo. Have file cabinets built-in to a custom design for perfect filing of letter or legal folders. If you need beautiful furniture such as lateral file cabinets and affordable prices today, contact Mark Downs at 1.800.281.3696, take a look around our website, and come on in and see us! This entry was posted on Thursday, November 8th, 2012 at 6:18 pm. Both comments and pings are currently closed.